I returned to Liberia the weekend after July 4 th in the middle of rainy season. I took a new flight in this trip that streamlined my entry. Instead of the main airport, which is a couple of hours outside of town and a harrowing drive at night, I flew into the tiny airport in the middle of town. This airport is mainly used for internal Liberia UN flights, but, a commercial airline has begun flight service to and from this airport. A perk of landing at this airport is that it requires an approach from the interior of Liberia as opposed to from the ocean. A little explanation here – So, Liberia is a coastal country and Monrovia sits on the coast and most paths into Liberia approach from the ocean. The main airport is a few miles inland; even when approaching it during the daytime, the most one can see during landing is the beach and the swamp between the beach and the airport. Spriggs-Payne, the small airport at which I landed, is literally in the middle of town, maybe a half-mile from the ocean. In the past, flights would also approach this airport from the ocean since this is the most direct approach. That changed a few years ago. Across the street from the end of the runway is a large private house that belongs to former President Ellen Johnson Sirleaf. During her presidency, they enacted a policy that planes could not fly over her house, so, planes now have to approach the airport from inland, land, turn around on the runway, and take off towards inland. As annoying as this may be to pilots (I’ve heard a few grumblings), it does give me a great view of Liberia as we approach the city to land (and, again, when we take off). An interesting observation this trip was just how wet Liberia is in July. Liberia has two seasons – rainy and dry. Dry lasts from November-April, rainy from May-October (+/- a month). Within rainy season, there are actually two waves of rain; it (usually) rains torrentially in June and July, then stops for August, then pours for September and October. The rains are incredibly devastating; entire neighborhoods are destroyed and rebuilt annually, roads are destroyed, travel and commerce come to a halt for weeks on end…it’s a big deal. Construction cannot occur in Liberia from May until December (it takes about a month after the rainy season changes for the ground to dry). Although I witness this personally throughout my trips, it’s quite an impressive sight from the skies –the entire country appears to be underwater. Towns pop up like islands in the water, connected by roads/paths that are often entirely underwater; vehicles and houses are visibly underwater; in the more rural areas, makeshift docks and canoes connect flooded communities. 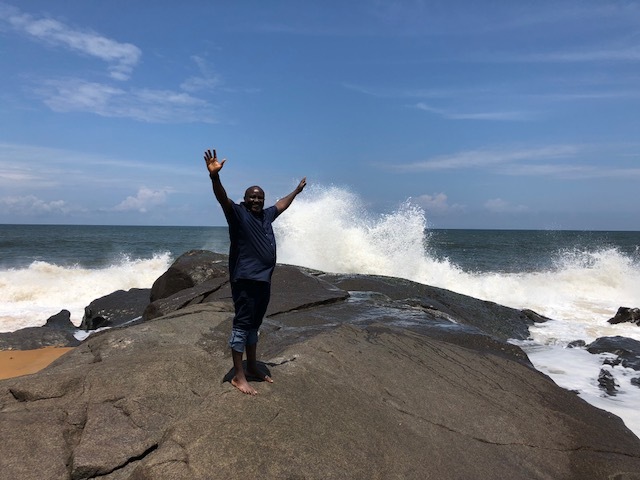 I always comment on how much harder it is to accomplish work during the rainy season and therefore spend more time here during the dry season – the images I saw from the plane really provide a large scale image of how hard Liberia is for everyone in the rainy season. At best, their homes are just flooded, but tens of thousands of people are displaced every rainy season. Stores don’t open, people often don’t go to work…because they have to wade, swim, or find a boat to get there. This also helps to ground some of my frustrations with inefficiency during rainy season. Unfortunately, ASKY airlines is extremely strict about having no phones turned on during takeoff and landing and I therefore do not have photos of this experience. Not only does this new flight route provide me with such a powerful view but I am also spared the drive to and from the main airport (which, including check-in time, takes essentially the entire final day in country to reach). Even better – this airport is only a few blocks away from my house in Liberia. For my first week, as usual, my goals were to assess the hospital planning. Our Co-Founder, Scott, planned to join me midway through the week so I wanted to conduct a rapid assessment in case he needed to bring unexpected supplies with him from the States. I headed to the hospital the morning after I landed and was pleasantly surprised – the hospital had been extensively renovated since I left in February and is nearly ready to open! Much had happened since I left – floors retiled, walls painted, HVAC ductwork completed, the entire facility had been wired for electricity…all things that indicated we would need to focus little of our time and effort on repairs and could instead focus on our main goals for the trip – staffing and equipment. Scott arrived at the main airport later in the week. We performed a formal evaluation of the state of the hospital (Scott made blueprints of the building) and met with our partners, all of whom were astounded by the progress on the hospital. Seeing how happy our partners in the hospital are with our progress makes me a lot less anxious about this project. And, yes, I’m anxious. Neither Scott nor I ever envisioned attempting a project this large in Liberia. As I’ve said before, the respiratory college we opened exceeded our expectations regarding our capabilities; opening a hospital seemed like an impossible undertaking less than a year ago and now we are about to do exactly that. Although this project is progressing quickly, I still find myself frequently frustrated with “Liberia time”. 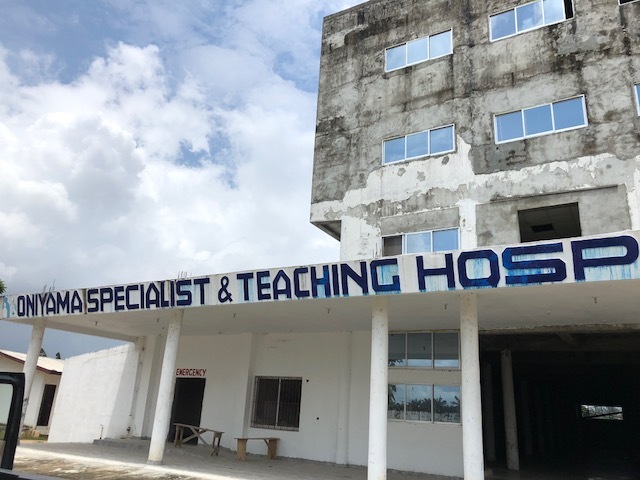 I have gotten accustomed to the difficulty of scheduling things in Liberia, particularly during rainy season, over the past 7.5 years I’ve been working here, but, since the hospital project began, I seem to have regressed in that regard. Or maybe since this is a larger project with more working parts, I’m more sensitive to the effects of “Liberia time” on joint efforts with colleagues. 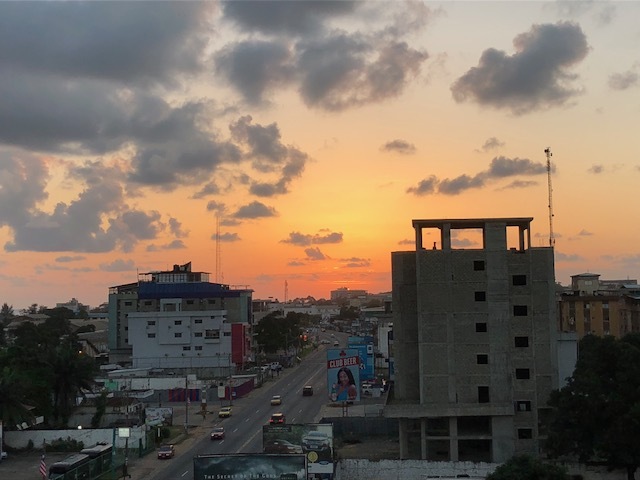 However, when we met with our partners in this venture, most of whom are as familiar with working in Liberia as we are (or more so), I found myself reassured about our timeline – everyone is impressed with how rapidly the project is moving forward. We are currently on schedule to open the doors of our specialty and teaching hospital at the end of September – roughly nine months after we acquired what was then an empty, concrete building. And Joe deserves every bit of credit for this. After settling into our house and checking in with our colleagues, Scott and I laid the planning for our two major goals for this trip – hiring our hospital administrator and receiving/clearing/unpacking our container of equipment. The last two things we need in order to open the hospital. This, also, requires some explanation. What is needed to open a hospital? The list is long, but, I can shorten it to some sort of financing, a hospital building/facility, staff, equipment, and supplies. We fundraised enough to acquire the building and continue to actively fundraise for money to support the hospital until it is sustainable, so, there are the first two items off of the list. Staff – we have healthcare (nursing, respiratory, radiology, etc) and facility (custodial, security, maintenance, etc) staff that we have interviewed over the past 6 months that are ready to begin. We also have identified local general physicians and Cuban specialist physicians that will run the medical service. However, arguably the most important role for making the facility successful is hiring an excellent Hospital Administrator. This role is responsible for oversight of…well…everything. Keeping the ship afloat. A key part of that is being able to interact nearly seamlessly between cultures. Many cultures. Workplace cultures (Physician/Nursing/Respiratory), Liberian/Cuban/US cultures. This person needs to be able to juggle a lot, and, our success depends upon it. We posted the position and received hundreds of responses, none of which seemed suitable. However, we finally found a great candidate a few weeks before this trip to Liberia named Rebecca. Now, we needed to interview her and see if we had a match. And, equipment. Most of our medications and disposables were identified and acquired prior to the trip. However, medical devices and machines are still needed to open the hospital and provide services to patients. As the hospital grows, we will expand and provide more services and acquire more equipment. In order to open, however, we need some basic things – beds, exam tables, chair, diagnostics (EKG, pulmonary testing, etc), imaging (X-ray, ultrasound, etc), lab devices (centrifuges, microscopes, etc), and treatment equipment (IVs, oxygen, defibrillators, surgical devices, suction, etc. ), for example. We acquired a 40-ft container filled with this equipment (and more) from Brother’s Brother Foundation in May and put it on a boat in June. Well, Liam, our Executive Director in the States did. That container was due to arrive in late July, and we needed to be ready for it. So, week two was devoted to evaluation of Rebecca, our candidate for the Admin position. 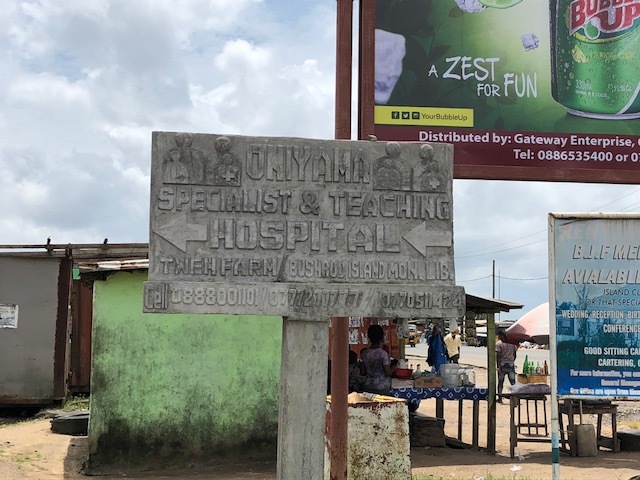 We spent several days interviewing, toured the hospital facility and our attached housing for staff, and generally discussed how the position could work for everyone involved. By the end of week two, we had identified our Admin and she had accepted the job! So, let’s talk about Rebecca – I had met Rebecca a few trips ago. She was a Peace Corps Volunteer assigned to Liberia for two years with similar interests in sustainable healthcare education, so, we had become friends. She was actually initially in Liberia with Peace Corps in 2014 but we evacuated during the beginning of her tour due to the Ebola outbreak. 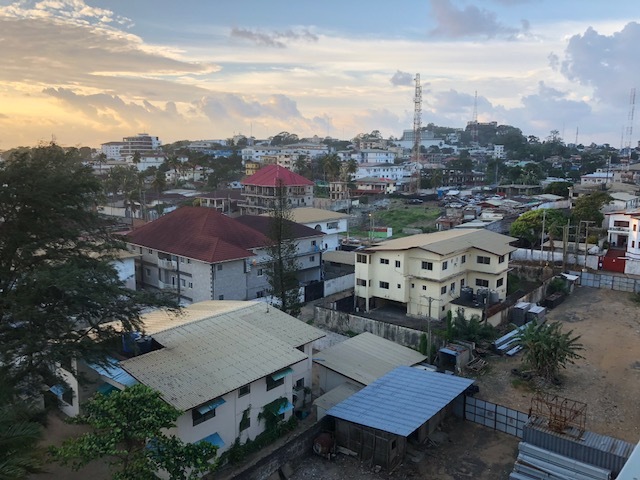 Peace Corps suspended their activities in Liberia for two years, during which she continued working in international aid, and then when they restarted in 2016, she signed back up for Liberia. Her two years ended this summer and she wanted to stay and work in Liberia and reached out to us. During her time in Peace Corps in Liberia, she worked as a high school teacher in a rural high school and assisted with administration there. She roughed it – lived and worked in the bush, was immersed in Liberian culture as opposed to the expat life in Monrovia. An educated person, incredibly familiar with and passionate about the complexity of life in Liberia, Rebecca seems like an ideal candidate for the job. Rebecca started and funded her own education project for her village in the bush this summer. This is a part-time endeavor, making her available part-time from August until the hospital opens (which is perfect for us because we don’t need someone full-time until then). We are quite excited about Rebecca. So, after Rebecca joined the team, we spent a week orienting her to Partner Liberia! And then, the container. Our last week and a half was set aside for receiving the container. With Rebecca on board, this was also a great training opportunity since receiving/clearing/unloading containers will be a large part of the first few months of her job. And, this first time would certainly be memorable. So, how do we get a container filled with medical equipment to our hospital Liberia? This is one of the most complex processes we undertake in our work in Liberia. It is long, tedious, unpredictable, frustrating, expensive, prone to corrupt practices, and…necessary. It’s probably easiest to describe how it is supposed to happen and then detail how this one happened. Once you have a load of equipment to ship, you contact a trucking company and a shipping broker. The trucking company is simply responsible for bringing an empty container to your warehouse, letting you load it, and taking it to the port to be loaded onto a boat. The shipping broker coordinates which boat to load and the destination to which to container is delivered. Once it arrives in Liberia, a truck is arranged by Joe to deliver the container from the port to the hospital. The only other major part of this process is the inspection – a private company conducts inspections of your container while you load it to verify the contents of the container and conveys this list to the country in which you are importing goods so that taxes can be levied upon you. 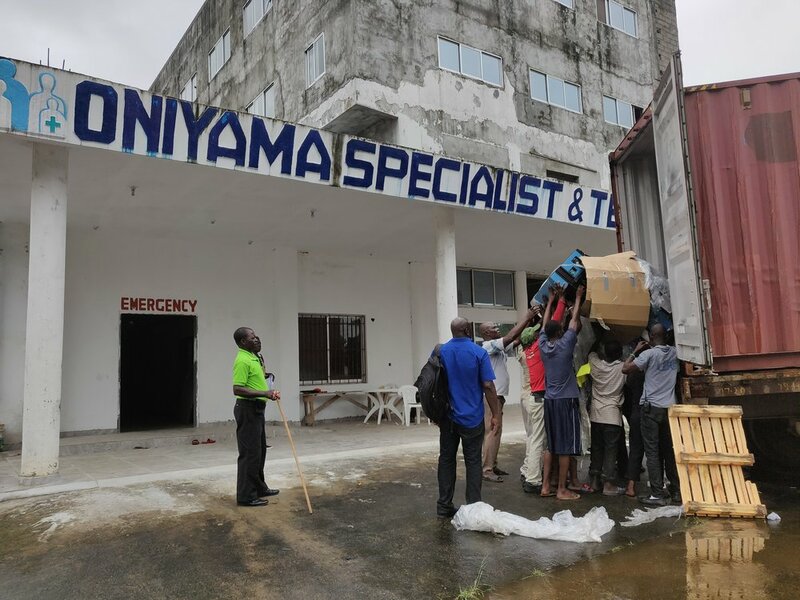 In this particular instance, the driver and inspector were set to arrive in mid-June for loading and then the container was to leave Baltimore July 1 st and arrive to Monrovia on July 18 th . My trip in Liberia was from July 5 th to August 6 th . Simple enough. The container actually left Baltimore on time. Storms at sea delayed the arrival of the ship to Monrovia by two weeks and the container arrived while I was still in country on August 1 st . However, the port was closed for two days due to a holiday, after which we were informed by the inspection agency that our inspection papers were inadequate. This…is a scam. Remember, the inspector was sent by this same agency and declared that our container passed inspection and notified the company of the same thing. And, now, that same report is deemed inadequate. What’s the reason for this? Inadequately inspected containers are fined twice the port fees of normal containers. They will still get through the port, nothing will be different about them – you just have to pay more to the inspection agency. Or, you can challenge the process. If you challenge the process, your container begins to accrue storage fees in the port until it is cleared (~$500 per week). Luckily, Joe was ready for this – two weeks of arguing with the inspection company, providing redundant documentation, and working our way up their chain of command (and several hundred dollars in port fees), and our container was released…a week after I returned to America. As disappointing as it was to not unload the container myself, Rebecca got one hell of an orientation to the port system! The contents of the container were entirely donated to us by Brother’s Brother, as was their assistance with loading the container. And, the container is filled with incredibly valuable goods to us. Still, approximately $4000 for inspection/shipping, $2500 in port fees, taxes, and a Liberian truck rental, another $1000 in storage fees while we fought with the inspection agency = $7500 + about 3 months of effort to get a container to Liberia. All of that said, this process is still much improved compared to what it was less than two years ago when we imported a donated pickup truck ($7500 to get it out of the port), and, the time and price are well worth the precious cargo. And, then another month in Liberia was gone. Please consider donating to Partner Liberia and liking our Facebook page to support our work.